It was billed as a "press conference" on redistricting, but it was more like an anti-gerrymandering rally, where reporters were outnumbered 5-1 by clapping supporters of the governor's plan. Governor's office photo. HOGAN SIGNS ON TO GERRYMANDERING CASE: Gov. Larry Hogan announced Thursday that he would sign on to a nonpartisan friend-of-the-court brief filed in a gerrymandering case now before the U.S. Supreme Court that challenges Maryland’s congressional districts as redrawn and approved in 2011, Bill Zorzi of Maryland Matters writes. The court announced last month that it would hear the case, Benisek v. Lamone, a challenge from a group of Maryland Republicans who argue that the Democrats violated their rights when they drew the lines for the 6th Congressional District in Western Maryland after the 2010 census, writes Ovetta Wiggins in the Post. The district contains all of Washington County, and one of the plaintiffs in the case is Washington County Republican Central Committee Chairman Jerry DeWolf, Tamela Baker of the Hagerstown Herald-Mail reports. Plaintiffs argue that the way district lines were drawn after the 2010 census violates the First Amendment by unfairly representing Republican voters. Hogan, a Republican, and former California Gov. Gray Davis, a Democrat, are jointly filing the brief and calling on other current and former governors to join them and oppose what Hogan called “shameful gerrymandering,” Scott Dance of the Sun writes. Danielle Gaines of the Frederick News-Post writes that with Hogan and Davis signing on, the Frederick County plaintiffs challenging Maryland’s congressional district map at the U.S. Supreme Court have found a new ally in this pair of governors. THE AMAZON STORY: Amazon dashed the Baltimore region’s hopes of landing the plum prize of its second headquarters and tens of thousands of new jobs, as the online retail giant excluded the city from its list of finalists announced Thursday, reports Pamela Wood in the Sun. But Maryland remained in the chase, with Montgomery County making the list of 20 finalists, and state officials quickly began assembling an incentive package to help the Washington suburb land Amazon. Gov. 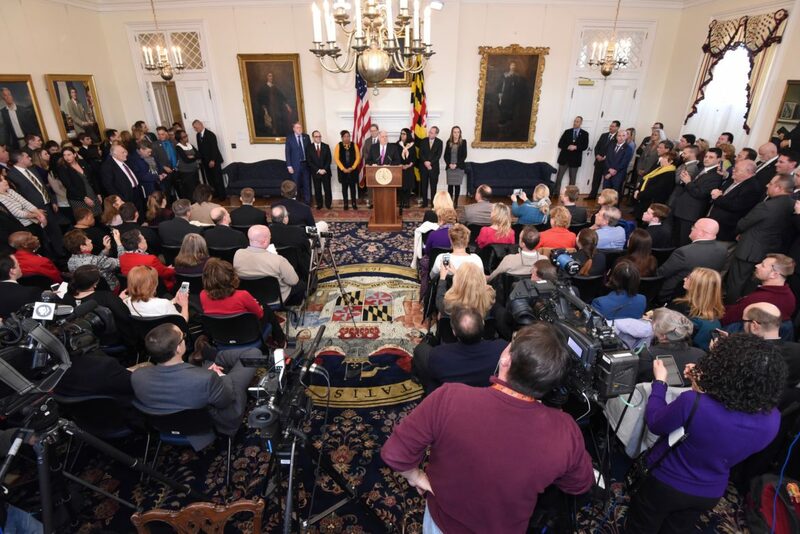 Larry Hogan’s administration will submit legislation Monday to build a $5 billion incentive package to lure Amazon HQ2 to Montgomery County, the Sun’s Erin Cox is reporting. The proposal — a combination of state and local tax incentives and big infrastructure improvements — will require approval from state lawmakers and would be the biggest economic development deal offered in state history. The nation’s capital is heavily represented, with D.C., Northern Virginia and the Maryland suburb of Montgomery County also making the cut, Brian Fung of the Post writes. Gov. Larry Hogan (R) said Thursday he is “thrilled” that Montgomery County remains in the running for Amazon’s second headquarters. On Thursday, the online retail giant announced that it has culled its list of applicants from 238 to 20. Montgomery, the District of Columbia and Northern Virginia made the cut. Prince George’s County and Baltimore city did not, Bruce DePuyt of Maryland Matters reports. The inclusion of Montgomery County on the list of 20 was especially welcome there and in Maryland, allaying the acute disappointment experienced last week when Discovery Communications announced it was moving its headquarters from Silver Spring to New York, the Post is reporting. Montgomery County Council President Hans Riemer said the jurisdiction and the state now have to start the hard work of trying to lure Amazon to Maryland. The inclusion of Montgomery County along with Washington and Northern Virginia, he said, shows the company does have a focus on the capital region, writes Adam Bednar for the Daily Record. SCHOOL SECURITY FUNDING: Gov. Larry Hogan’s fiscal 2019 budget proposal includes $2 million for security enhancements at schools and child-care centers, a response to an increase in hate crimes in recent years, writes Rachel Siegel for the Post. If the funds are approved by the Maryland General Assembly, institutions perceived to be vulnerable to hate crimes or attacks would be able to apply for grants to upgrade facilities, hire security guards and teach safety training. NEED FOR SHARED PARENTING: Dr. Ned Holstein, of the National Parents Organization, in an opinion piece for Maryland Reporter, writes that the chance to brighten the lives of children through reform of custody laws has rightly become a major issue in Maryland. “When our society first liberalized divorce laws many decades ago, he writes, we rationalized the exciting new options for adults with the soothing illusion that a divorce is difficult for the children, but that they soon adjust smoothly. While this is true for many children, research makes it crystal clear that millions of other children suffer deeply, mostly those who do not have shared parenting,” says Holstein. FELONY ASSAULT: A Maryland state delegate has proposed boosting the penalty for assaulting a transit operator, a growing problem for Metro and other transit agencies. The bill, introduced by Del. Angela M. Angel (D-Prince George’s), would make it a second-degree felony to intentionally cause physical injury to a transit operator, punishable by up to 15 years in prison and a $5,000 fine, Martine Powers of the Post reports..
ADDICTION TREATMENTS & POLITICAL AGENDAS: Former state Del. Matt Mossburg, a recovering opioid addict and drug policy adviser, writes, in an opinion piece for the Washington Examiner that a partisan drug fight swirled in the background last year amid other developments in the nation’s opioid crisis. It’s an unfortunate development whose continuation in 2018 should be watched closely. And it has to do with which drugs are effective in helping addicts recover. Beware of agenda-driven politicians, professors, and reporters recommending one specific treatment drug. ADDICTION TREATMENTS & RESEARCH: In response to a Jan. 2 column Mossburg wrote for Maryland Matters, Ellen Weber of Legal Action Center and Dr. Anika Alvanzo of the American Society of Addiction Medicine counter his arguments about Maryland’s methods for treating addiction, writing that Maryland’s response to the opioid epidemic – unlike Mossburg’s prescription – has been aligned with decades of research into how best to treat the disease of addiction. ARUNDEL DELEGATION MEETING: The Anne Arundel County Delegation has requested extra seating for today’s delegation meeting thanks to three special guests. County Executive Steve Schuh, Annapolis Mayor Gavin Buckley and county police Chief Timothy Altomare are scheduled to make presentations to the county delegation starting at 8:30 a.m. It will be held in Room 142 of the Lowe House Office Building, Chase Cook reports in the Annapolis Capital. ON DEL. TURNER: Kate Magill of the Howard County Times profiles the career of retiring state Del. Frank Turner, who has served for 23 years in the House of Delegates, the first African American from Howard County. Turner also publicly endorsed a possible successor, Howard County Council member Jen Terrasa, as well as Rushern Baker for governor. EXEC BRANCH POSITIONS: Bill Zorzi of Maryland Matters writes that Maryland government needs to fill more than 2,600 positions in its executive branch agencies – nearly half of them in the Department of Public Safety and Correctional Services – at a cost of more than $96 million. HOGAN HAS LESIONS REMOVED: A morning procedure in a doctor’s office had Gov. Larry Hogan looking a little different during an afternoon news conference. Bryan Sears of the Daily Record reports that Hogan sported three small, flesh-colored bandages on his forehead during a redistricting reform news conference Thursday. The bandages were the result of a minor procedure Thursday morning to remove what was described as three small skin lesions at a dermatologist’s office. HOGAN’s FILLED COFFERS: Josh Kurtz of Maryland Matters reports on the fund-raising efforts by Gov. Larry Hogan compared to the pack of Democratic hopefuls. Hogan is outpacing his rivals, with a total of more than $9 million on hand compared to their combined total of $7 million. Kevin Kamenetz leads the Democratic pack with $2 million, but Rushern Baker still leads in the polls. SMALL BUCKS IN GOP COMMITTEES’ COFFERS: As races continue to take shape around Maryland, Brian Griffiths of Red Maryland looks at the coffers of the county Republican Central Committees to discover some interesting numbers, not all of them promising for what is in store for Maryland’s Republican candidates. FUNDRAISING RACE FOR COUNTY EXECUTIVES: Maryland Matters compiled a snapshot of fund-raising for the races for county executive throughout the state. IN PRINCE GEORGE’s: Bruce DePuyt writes in Maryland Matters about Angela Alsobrooks astounding lead in fundraising for her run for the Democratic nomination for Prince George’s County executive against the likes of veteran politicians Rep. Donna Edwards and state Sen. Anthony Muse. Alsobrooks reported 2,000 individual donations from a total of 1,600 people, most of them county residents. She said donors included her childhood neighbor, business owners, sorority sisters and politicians across the state. But her support also included influential law firms, well-known real estate developers and lobbyists in Maryland, Arelis Hernandez of the Post reports. IN MONTGOMERY COUNTY: Bruce DePuyt of Maryland Matters writes that while County Councilman Roger Berliner (D) has amassed the largest war chest of any of the six Democrats hoping to succeed Ike Leggett (D) as Montgomery County executive, the source of his funding is already giving rivals ammunition to use against him. Berliner’s filing statement is awash in large contributions from people with ties to the real estate community and regional business interests. While Berliner raised far more money last year than those he’s competing with to be the next county executive of Maryland’s most populous county, Rachel Siegel of the Post reports that sizing up who is viable and who isn’t is somewhat colored this year by the debut of the county’s public-financing system, which has different reporting requirements. MO CO COUNCIL AT-LARGE FUND-RAISING: Louis Peck of Bethesda Beat writes that reports filed with the Maryland Board of Elections, that with a little more than five months to go until the June 26 primary, a half-dozen Democratic contenders in the crowded race for Montgomery County Council at large have amassed campaign treasuries exceeding six figures—with a seventh candidate not far behind. Adam Pagnucco of Seventh State blog lists all 31 contenders for these at-large seats and their fund-raising figures. He also assesses how this race is shaping up. MO CO CANDIDATES LIST: Here is MarylandReporter.com’s updated list of candidates for local, state and federal office in Montgomery County as best as we could determine as of Jan. 15, 2018. The list includes over 150 candidates already, at least 33 (including 30 Democrats) just for the four at-large seats on the Montgomery County Council. There are changes for the 6th Congressional District, and more candidates have announced or filed for the state legislature. FEDERAL SHUTDOWN: A government shutdown appeared likely after Congress deadlocked over a proposed four-week stopgap spending bill to keep federal offices open past Friday’s deadline. Lisa Mascaro and Jean Mirabella of the Sun write that the threat of a federal shutdown today looms large in Maryland, where about 300,000 residents work for the federal government — at the massive Social Security Administration headquarters in Woodlawn, multiple Veterans Administration facilities and agencies ranging from the Department of Defense to the National Institutes of Health.